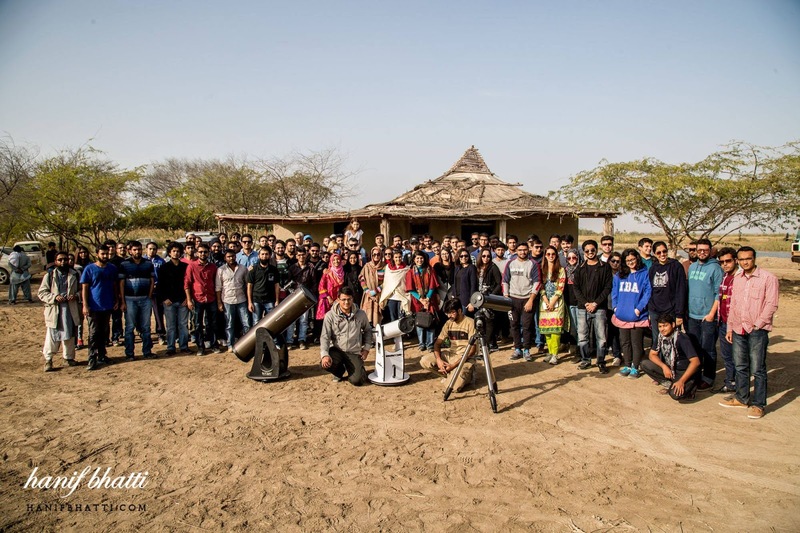 I was in Pakistan earlier this month and I had the chance to meet a number of amateur astronomers in Pakistan. 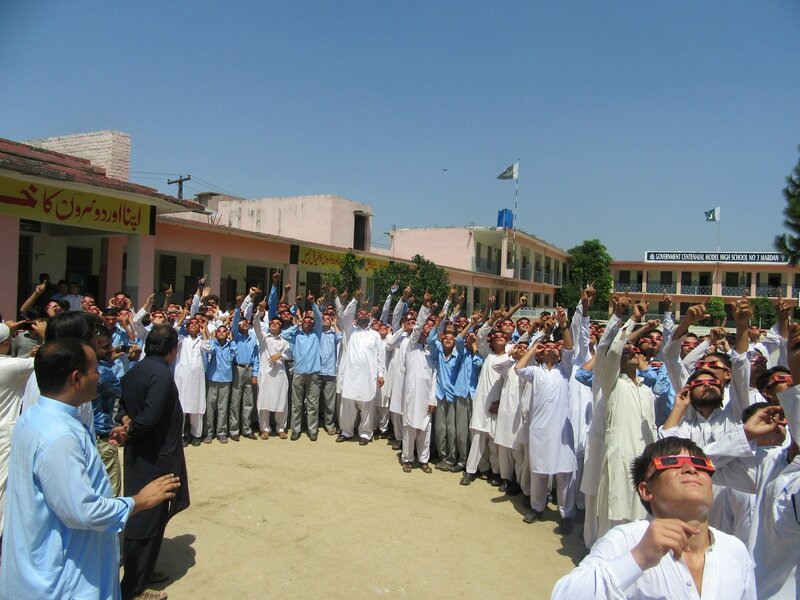 I have highlighted their activities on the blog before (for example see: Public Astronomy Flourishing in Pakistan). However, this time I had a chance to visit the centers of both the Lahore Astronomical Society (LAST) and Karachi Astronomers Society (KAS). These folks are doing some amazing work - both in astronomy and for the promotion of the love of sciences. I have been engaged with astronomy developments in Pakistan more or less for the past 30 years. I have never seen amateur astronomy so healthy in Pakistan before - and there is every chance that it has a spectacular future ahead. Here are some quick highlights on what is going on with LAST and KAS. You need to get a critical mass in terms of active members to sustain a group. Both LAST and KAS have active members that number between 30-40 and their events can attract over a 100 members with ease. Furthermore, most of the people involved in these societies have day jobs other than astronomy (interestingly, most of the KAS active members present at our meeting had computer/IT related degrees). But astronomy is truly a passion of theirs. They are following their dreams in every second of their spare time. Group photo of LAST members after my lecture in Lahore. Interestingly, the group in Lahore and the one in Karachi have different central focus. LAST, led by indomitable Umair Asim, has established a sophisticated observatory. They do imaging and spectroscopy from the light-polluted skies of Lahore. However, Umair believes (rightly so) that it is better to use the telescope regularly than worry about dark skies at the moment. LAST astronomers recently replicated spectral classifications of stars and have also taken the spectra of the gaseous giant planets in our own solar system. It is not unusual for me to receive an email from Umair from the observatory at 3 in the morning. They have also made beautiful movies of solar flares and prominences. But this is not why the observatory is great. Umair is also teaching others on how to use the telescope, take data, and get science out of it. Currently, he has four members (3 women and one man) who are doing internship with him - and they have the same level of enthusiasm for astronomy (remember - this is not for any job prospect. This is just to learn about astronomy). One member, Roshaan, recently dropped out of 4th year medical college (yes - only one year was left), to pursue astronomy full time. It will him some time, but this is the path he is now committed to taking. 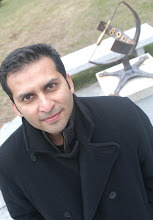 Umair and others routinely submit their results to Amateur Association of Variable Stars Observers (AAVSO). LAST is pushing the scientific boundaries of amateur astronomy. 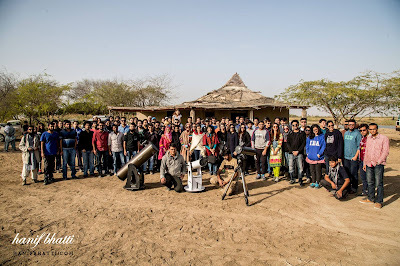 Karachi Astronomers Society (KAS), on the other hand, have been more focused on building telescopes and in regularly organizing observing sessions at dark locations outside Karachi. The center here is Kastrodome, an observatory that houses a 10-inch 12.5-inch Newtonian telescope. A team of three brothers, led by Mehdi, has been at the center of this effort, including designing and constructing a fully operational dome structure. But then, these brothers started experimenting with optics when they were young, and making a telescope out of their father's spectacles. Just like LAST in Lahore, members of KAS give classes on building telescopes as well as on the broader principles of astronomy. Another KAS member, Sajjad, has a solar telescope and specializes in taking images with that. Of course, he was being called Chacha Shamsi (Uncle Solar). Telescopes have proliferated in Pakistan because one KAS member decided to do a business of selling telescopes from his apartment. And no, the purpose is not here to make a lot of money, but to make telescopes available in Pakistan. Getting a telescope or any of the astronomical gadget through the customs is a herculean task and often they impose duty that is more than the equipment itself. In this context, having a local dealer is immensely helpful (now only one person has to do all the hassle...). At the KASstrodome in Karachi - outside and inside. In the picture above, Mehdi is the first one on the left. 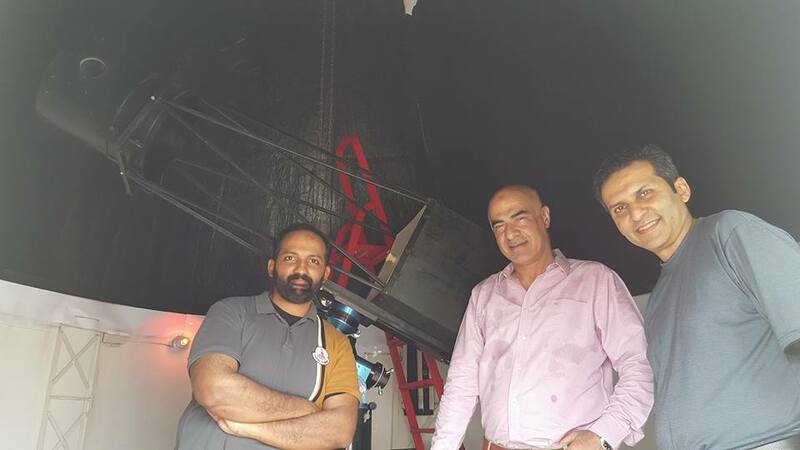 In the picture below, the two people next to me are Umair Asim (from Lahore Astronomical Society) and Khalid Marwat, a pilot and one of the first serious amateur astronomers of Pakistan. I also appreciated this sign next to the observatory. 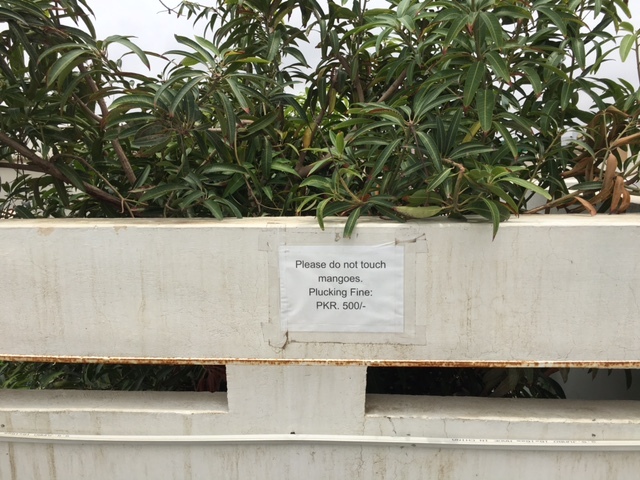 Mangoes - after all are a serious issue!! But it is observing from dark sites that is the hallmark of KAS. Once a month, KAS members would charter buses to go 2 hours out of Karachi. As Mehdi noted with good humor, the lack of development on part of the Sindh and Baluchistan governments offer plenty of dark skies for astronomers. These night time sessions, called Rutjuga, would attract more than a hundred members on each outing! This has also led to some spectacular photography of the night sky done by KAS members. Perhaps, one of the most awesome part of amateur astronomy scene in Pakistan is that it is not selfish. It is easy to keep these fantastic telescopes to oneself and satisfy one's own interests. But it is clear that these guys love astronomy because they want to share everything they know. LAST has been doing some incredible public events for more than a decade, including taking telescopes to schools in small towns and villages. It is not uncommon for them to get a crowd of 500 or a 1000. KAS has a similar experience in Karachi, and they are holding public seasons in parks and at the Karachi Planetarium. They are all preparing the next generation of astronomy enthusiasts. I am leaving out a lot here. But it is clear that the astronomy scene is only going to grow from now. There already was a news item recently of an astronomy enthusiast from Quetta. There are ongoing conversations about the formation of The Astronomy League of Pakistan (ALOP) - an umbrella organization that connects all the astronomy societies of Pakistan. We are also thinking of possibly having an annual meeting and a Pakistan Astronomy Day, where astronomy clubs all across Pakistan hold events for the public. In 1988, I was part of a group of 11th-12th grade students who started the first astronomy society in Pakistan, called Amastropak. We had some great few years but it could never develop a critical mass, and ultimately ceased to exist in the late 1990s. Both LAST and KAS are clearly well beyond that stage and I can see a transition from serious amateur astronomy to the development of a thriving professional astronomy scene in Pakistan in the next decade or so. Stay tuned to this really fascinating astronomy chapter in Pakistan. Very well written article. Just a bit of correction - the telescope in Kastrodome is 12.7 inch Newtonian , not 10 inch. Awesome. :) it was great to meet you. Great to know that you liked our activities. And Astrophotogrpahy specially the deep sky objects are also a thriving passion of KAS members. Thanks anonymous. I fixed it. It was great to meet you as well, Abubaker. And yes, I have seen some of your (and other KAS members) deep sky astrophotography - and that is quite spectacular. Thanks for reinforcing that point! Just to add tiny little bits of activities from around Rawalpindi and Islamabad. 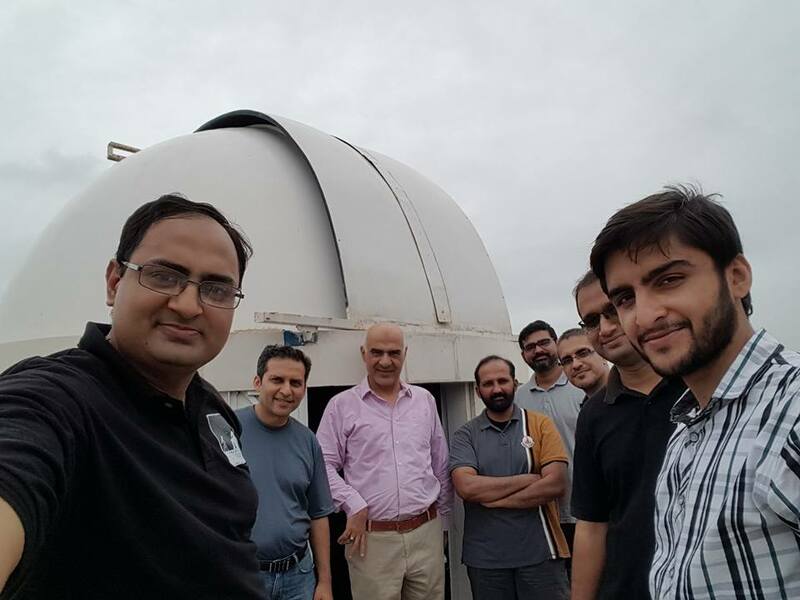 We are a small group of astronomers who formed Pakistan Astronomy Society (PAS) in December 2007 and working eversince. We have not been active lately but have contributed our little share to spread the passion of astronomy among the youth of this region. Sir, let me take this opportunity to remind you to a memorable meeting with you at your residence in Rawalpindi on December 07， 2008 with Abdul Moiz and Saif ul Islam sb. Thanks for the appreciation. It was a pleasure meeting you. Thanks Furrukh, I'm glad there is activity in Rawalpindi/Islamabad as well. I'm assuming you are in contact with Umair Asim, who is leading the effort in establishing the Astronomical League of Pakistan (ALOP)? If not, you should contact him. And indeed there are astronomers in other cities as well - and we are trying to collect them under one umbrella. Chacha Shamsi - It was a pleasure meeting you! Yes Sir we are in contact with Umair Asim and working with him to make this national event successful. Great article covering astronomy related activities in Pakistan. I like to add that although the activities carried out by the astro enthusiasts of Islamabad/Rawalpindi area are not as extensinve as the friends from Lahore and Karachi, but we under the name of PAS Islamabad have been holding events like star nights and public outreach meetings regularly since 2007. We held numerous star parties at places such as NUST, COMSATS, IST, NIE students and at public places, parks, sports stadium to mention a few. We are in touch with Umair Asim and fully support ALOP. Thank you for the recognition, Dr Salman! I was able to present a fun lecture on Astronomy and its peaceful implications to more than 1000 students from 7 different schools one day ahead of the Mardan event in KP. It was fantastic. I have a similar tour to thre south coming up: (DG KHAN, SUKKUR, LARKANA) on 29th, 30th and 31st August. Super excited about that. I want every curious kid out there to know more about astronomy and their 'place in space'. My ultimate goal is to help setup astronomy depts across all major universities in Pakistan. But first....I need to get the appropriate academic 'miles'. Which I DEFINITELY WILL!! #AstronomyInPakistan ! Pretty awesome Salman with everyone doing their part! Amastropak might not be active today but it has more than made its mark and, judging from what I sometimes hear, has provided one of the first sparks which are turning into bright flames now. I remember going around schools with our TV and VCR showing the solar eclipse '99 video we had made atop Hamdard University's campus. Farrukh and Saif sb, great to see you here. Just saw the pics and got lost in the memories! Great stuff.